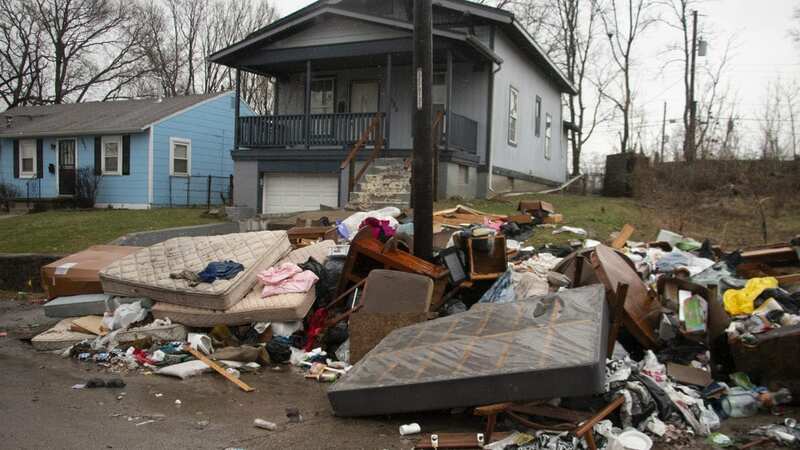 Just imagine what $1.5 billion would do for blight on Kansas City’s East Side. Well, if Bill Drummond had his way, the city would make sprucing up neighborhoods as big a financial priority as the billion-dollar-plus project to replace Kansas City International Airport. Drummond, a volunteer from the Manheim Park, an urban core neighborhood, spoke Saturday from a truck bed filled with discarded tires collected through a city-sponsored cleanup. The snow from earlier in the morning had stopped, but it was still raining, windy and cold as he unloaded the tires at the East High School drop-off point, 1924 Van Brunt Blvd. “This is us as volunteers coming out, and doing the hard work, which we do not mind doing,” Drummond said. But he would like to see cleanups happen every month. Saturday’s event covered 13 neighborhoods, and smaller efforts do happen periodically. Neighborhood improvement has emerged as a key issue in the contest to replace Mayor Sly James and in City Council races. Today’s primary will narrow the field of candidates heading into the June 18 general election. Kansas City PBS is focusing its election coverage on outlying neighborhoods like Blue Valley, which stretches east from Van Brunt all the way to Interstate 435. These sections of town have, for the most part, missed out on the economic progress that is now happening along Troost and Prospect avenues, and within certain areas of the Historic Northeast. City officials said it will be a few weeks before they get a final tally on the amount of rubbish picked up Saturday. But Robert Woods, special projects coordinator for the Neighborhoods and Housing Services Department, said cleanups this large usually collect about 21 tons of trash and as many as 1,600 tires. The city-funded effort included 25 trash trucks. Even with such city assistance, people like Vincent Muhammad remain displeased with municipal efforts to control illegal dumping and to hold residents accountable for trashy property. Muhammed, who lives in the 3700 block of Bales Avenue, arrived at East High School with about 80 or 90 bags of illegally dumped trash that he said was strewn across his two lots. “Mattresses, tires — you name it, it is there,” he said. It cost him about $400 between labor and supplies to collect all the junk he brought to the cleanup, and in his mind, he should be reimbursed by the city. That was his idea for the new set of elected officials about ready to take office this summer. Another thought came from Blue Valley resident Jim Sevart, who said the city should enact whatever additional ordinances are needed to ensure that people maintain their property. And Drummond, the volunteer from Manheim Park, offered up more solutions, too. How about direct city funding for these volunteer neighborhood associations, he said. Redirecting funds lost through development tax breaks to neighborhoods would also be nice, Drummond said. But all that’s down the road, and on Saturday, Drummond was looking at the bright side, despite the dismal weather.